Color coordinating your home theater is an exciting but sometimes daunting task. 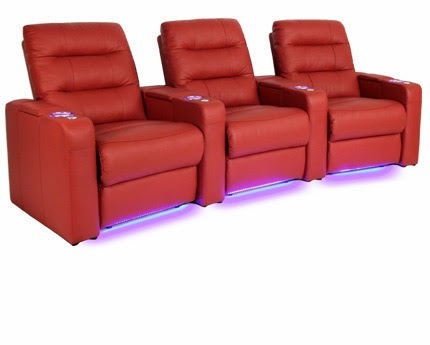 Home theater seats come in so many different colors--black, brown, red, burgundy, white, grey--that sometimes it's a challenge to pick just which colors, and combinations of colors, will best reflect the particular ambience you wish to impart to your theater. When added to the dozens of different theater decor accessories 4seating offers, the task can seem especially bewildering. What follows are a few simple tips that should make designing the perfect home theater a relatively painless process! BLACK: Black is the holy grail of color coordination, as it can be paired with just about any other color. Those who wish to use their theater for family occasions will find it especially useful in hiding stains, pet hair, and spills. It can also project both a classic and a contemporary look, as it never seems to go out of fashion. 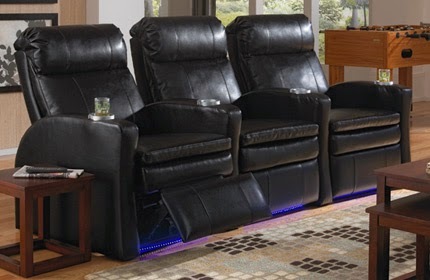 If you choose black as the color for your home theater seat, however, you should avoid painting the walls of your theater black as it will result in an over-saturated look. If you do so, however, you can enliven the room by placing other decor items (paintings, columns, accents, panels) in brighter colors for contrast. Red, blue, and white are especially good colors to coordinate with black. RED: Red is an ideal marquee color that evokes the golden age of cinema. This flashy color will enliven any get-together, providing a festive ambience. Red seating against creamy white walls will create a startling art-deco look, while red against black will transport you right back to the movie theaters of the 20s and 30s. Children may also find red seats to be a fun alternative, although as with adults you will want to get their opinion in advance. The Excalibur from Seatcraft is a premium choice for seating that comes in this bright shade. BROWN: Brown is an earthy tone that can be combined most readily with black, white, or green. It oozes a homely, comforting warmth that, like black, can also make it ideal for virtually any setup. With brown seats, plants located at discreet corners of your theater can help accentuate the natural feel. Also like black, dark brown shades can be used to hide stains and spills. The Grenada from Seatcraft is a beautiful chair that comes in a richly hued dark brown leather. BURGUNDY: Burgundy is a darker shade of red which can range in tone from a purplish character to a reddish-brown. This color is ideal for those looking for a more idiosyncratic tone than the usual white or black, while being more subdued than ordinary red. Burgundy coordinates well with either white or black walls, depending on your taste, and can provide a touch of elegance to any home theater setup. It is also a romantic color that will complement an evening with your loved one and a glass of wine. 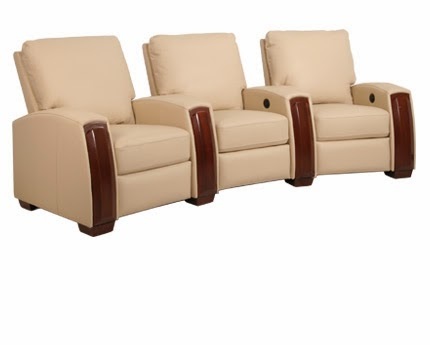 The Gambler is an ideal home theater chair from Lane which comes in a burgundy shade option. WHITE: White lends an airy sense of spaciousness to any room, although you need to be careful in matching it with other colors. With white, lighter spring shades of blue, yellow, green, or pink are best, although a smartly contrasted white-on-black combination can also provide art-deco thrills. White chairs against white walls creates its own particular effect, although as with black-on-black one needs to be careful about oversaturation. A discreetly placed wall accent may be the perfect thing to break up the mood in such a case. With white seats you should be especially mindful of stains, spills, and pet hair, so you might want to keep cleaning tools handy, or take advantage of 4seating's special Montage five-year warranty.